Effective Patterns: #10 Pine Squirrel Leech, #10 Mayer's Mini Leech, #20 Juju Baetis, #20 FB Mercury Pheasant Tail, #20-22 Choc Foam Wing Emerger, #22 Stalcup's Baetis, #20-22 Red Larva, #22-22 Mercury Blood Midge, #18 Mico Egg, #20 Mayer's Tube Midge, #20-22 Mercury Midge, #20-22 Manhattan Midge, #20 Pale Olive Midge Larva, #22-24 Black Beauty, #22-24 Bling Midge, #22-24 Top Secret Midge, #22-24 Minute Midge, #22-24 Jujubee Midge, #22-24 Matt's Midge, #22-24 Griffith Gnat, and #24-26 Parachute Adams. The lush meandering, meadow portion of the South Platte between Spinney and Eleven Mile Reservoirs is known as the “Dream Stream” or the Spinney Mountain Ranch. This beautiful 3-mile section of the Platte offers anglers the opportunity of a lifetime to catch large trout. 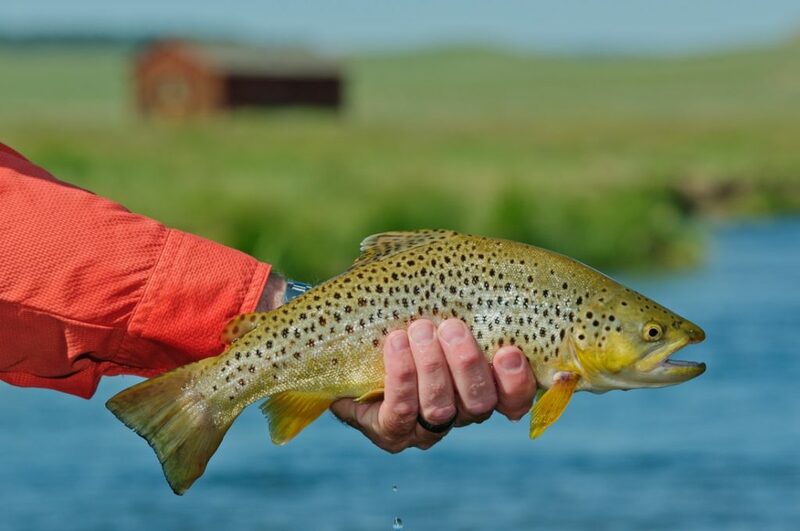 This fabulous tailwater fishery is located in the heart of South Park, tucked between 14,000 foot snow capped peaks on the west, rich ranchland to the north and south, and Pikes Peak on the east. Spinney is a well-balanced fishery where anglers can catch trout on nymphs, dry flies, and streamers. The river is comprised of prime trout habitat, which includes, riffles, runs, gravel bars, shelves, and undercut banks. Fly-fishers can expect to catch a mixed bag of rainbows, browns, and cutthroats in 10-18 inch range. In addition spring (rainbows, and cutthroats) and fall (browns and kokanee salmon) spawning runs from Elevenmile Reservoir are quite impressive with fish up to 10 pounds landed during a key three-four week period. Ideal flow conditions for “Dream Stream” are between 100 and 250 cfs. The regulations are flies and lures only and all fish must be returned to the water immediately. The stretch below Spinney Mountain Reservoir is fishing fair right now. Flows are low and clear, setting the stage for some technical fishing. Anglers should prepare themselves for intermittent hatches of midges and a few sporadic blue winged olives. Anglers willing to work hard, cover lots of water, and sight fish, are catching a handful of quality trout, but you have to put in some effort to catch the bigger fish right now. Look for low flows until Spinney Reservoir fills.